Yes, now that we have a house with a yard. It’s not huge but we have a few different veggies and will freeze the extras. we have 1/3 of our backyard converted to a garden. It’s the only way I know of to be able to afford quality, non gmo, organic produce. sure, it’s work, but I don’t mind it for myself. Container gardening, windowsill gardening, and even those topsy turvy things make it so easy for anyone to have some fresh produce. So, those topsy turvy things actually work? I’m thinking about those strawberry and tomato things, that you can buy on TV? Is that what you’re talking about? I didn’t have great luck with them. They’re really too small for tomatoes. I had to water twice a day to keep mine from looking half dead in the summer, and it still didn’t do great. I planted one with a bell pepper plant and that did better. The stem cracked under the weight of the plant, but it still grew and made peppers. There are lots of opportunities to glean unused fruit for canning, and Craig’s list is a great place to look. I have readers who can hundreds of jars of fruit that they pick for free from others’ trees. I have gleaned fruit, too (mostly pomegranates). I think one of the most important things to plant is fruit. So often people think of a garden as just vegetables. Fruit trees, vines, and bushes produce year after year. Dwarf and semi-dwarf fruit trees make it possible to grow even more varities in a small space. I havea .24 acre lot in the desert. It was over 100º today. Today I harvested green onions and lettuce from our garden. Next month we’ll have peaches, figs, plums, and more. You have a beautiful garden!! We planted a honeycrisp apple tree and a pear tree last year. This year we are planting a peach and hopefully a cherry tree. We also have blueberry bushes and rasperry bushes. I want to keep it as organic as possible though, and don’t know where to start to keep the pests and birds away. Any suggestions?? Organic means so much more than spraying/not spraying. There are organic sprays (such as BT for caterpillars, neem oil and cottonseed oil for other bugs, and soap sprays for aphids), but growing organically includes using organic fertilizers instead of chemical ones, and even, technically, organic seeds. Pick bugs off manually: This means cutting tomato hornworms with pruning shears, picking off squash bugs and stepping on them, picking off caterpillars from lettuce and smashing them. You can net your trees for birds, but it’s expensive and difficult. The week the fruit is ripe, I send the children out several times a day to run out and scare the birds off the trees. I know they’re ripe because the birds start to eat them two days before they are ready. For those few days while the fruit finishes ripening, everyone takes turns running out to chase the birds out of the trees. Some fruit always goes to the birds (especially at the top of the tree). If they’re started to eat one piece of fruit, leave it; often that means they continue eating that one before attacking many more. If you get fruit that has a couple of bites, cut it up right away (cut off the bit sections) and use it first. I forgot to mention: I’m adding passionfruit vines this year. Because they’re a vine, they can provide me more fruit in a small space. I’m planning to grow them against a wall in the backyard and against the house in the front yard. Great advice! I didn’t know birds were so picky! Thanks so much!! I love the idea of a garden but after one year of having one I quickly learned I was not a love the dirt kind of girl! I love the idea of the garden and the end result but struggle with the “planning and planting”. That may seem silly to some but I found it stressful and my husband didn’t want to help with it. So he removed it and sodded. However, I would like to have a few tomato plants and berries. We don’t have landscaping right now but was wondering about an ediable landscape and what might be good for that. We tried herbs one year as well and everything ended up going to seed! I feel like if we had a deck off our kitchen it would make it so much easier. I had the pots in the front of the house but was never out there much. If we had a deck I could put them there and they’d get plenty of sun and I could just walk out my kitchen door. My kids really want to garden so I will have to think of a few things we can do. Depending on what your kitchen is like, what about putting the herb containers right in the kitchen? I grow a few fresh herbs in 4 inch pots on my kitchen windowsill. They’re right there in front of me when I need them and to remind me that I need to water them too. I’ve had good luck with parsley, cilantro, thyme, and basil so far. For the basil I think a dwarf variety works best, but I’ve also used the regular sweet basil and just cut it back to keep it manageable. We live in a 900 sq. ft. apartment. We have six different herbs in our kitchen. In our spare bedroom, we have two tomato and green pepper plants, respectively. In terms of herbs, (2) basil, cilantro,(2) rosemarry, oregano, mint, parsley is what we’ve got growing. Just curious-if your tomatoes and green peppers are inside, how do they get pollinated so they’ll produce? I ask because I live in an apartment too, and tried squash outside on our porch last year, but didn’t get any produce because bees don’t seem to visit our patio. Thanks! You can pollinate your tomatoes and such by hand. Just take a q-tip and touch each flower. I would love to let my kids grow something. I am not a great gardener. Does anyone have any suggestions for the easiest thing to grow? I live in College Station, Texas. I would say the easiest thing to grow would be radishes. They grow well and mature fast. I think the next easiest would be lettuce. Both can be grown in containers if you don’t have a garden put in. We used to grow them in containers before we put in our raised beds. I’ve tried growing radishes but failed miserably! 🙂 Go figure. For growing something in College Station, I’d either try to grow something that likes the heat like peppers, rosemary, or basil. You could also ask your neighbors or at your local farmer’s market what’s easy to grow. Many plants like mint, thyme, and marjoram can be easy to grow, but I’m not sure about the Texas heat. How about coriander/cilantro? It reseeds itself which is a bonus. 🙂 Generally, it’s easier to grow plants that you eat the leaves because you don’t have to wait until you get a fruit or a root. Oh, college station is a completely different beast. I lived in Bryan and the soil there is atrocious. Most crops have to go in Jan/Feb. My former boss has snow peas coming up already. It’s about to get hot and take way too much water to do melons and such. Raised boxes in the shade (or full sun) would take less watering and you could better condition the soil. Plus, a lot easier to see the snakes in the beds! I used to do herbs, tomatos and green peppers in pots on my deck. They got a lot of sun, still shaded during high noon-4 and were much more manageable with water. I don’t know how our weather/soil compare, but we live in Dallas. Our little garden has really struggled, but rosemary seems to thrive (I found a great rosemary bread recipe that I can make mostly in the bread machine). Green onions are also doing great – if you don’t want to buy seeds, save the bulb part the next time you use a green onion. Plant it, and it will start growing. It’s amazing! And it grows fast, which is fun for the kids to see. Good luck! We have a very small yard, no room for a “real” garden, but we have had great success planting things that grow well in pots, or have small roots. Strawberries, onions, garlic and herbs all grow great in pots (we even have had success with zucchini). We also planted some dwarf citrus trees that are only 3 feet tall not very wide and sit against our fence, but have produced over 100 tangerines and 50 oranges every season we’ve had them! I have a big raised garden bed and what I grow varies from year to year. It really depends on the “season” in life and if we are able to commit to it. I never thought I would enjoy gardening but then I hit 39 and my husband and I really got into it. We’ve been planting a vegetable garden for four years now. Not only is it great to go out and pick vegetables and herbs for dinner, working in the garden has proven to be a major stress reliever for both of us. An hour after work, weeding and pruning and watering is nearly as relaxing as an hour on my yoga mat! Every year we grow more than we did the year before – gardening (well, producing our own food) is a hobby that both hubby and I share, and it’s so satisfying to be able to work on a project together. I’m very blessed that he does most of the “heavy lifting” (roto-tilling, watering, etc. ), and I learn new ways every year of preserving and using the things that come out of our backyard! We have chickens and honey bees, too, so we are never “done” learning, and it’s a very rewarding hobby (as well as saving our family WELL over $100 / year!). We square foot garden in our raised beds it works out well and we produce lots of vegetables for us all spring and summer. You can also grow plants upright if you are short on room. We grow cucumbers, on a trellis so they take up less room. Our neighbors grow some vegetables we don’t and we grow some they don’t so we can trade produce with each other. It makes for less work and more variety for each of us. Our HOA won’t let us have a garden. We have a very small container garden and grow some things indoors. 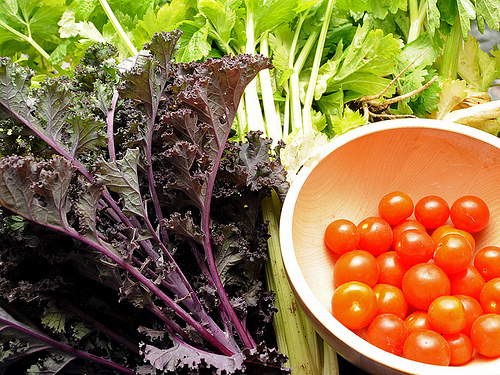 We joined a CSA last year and found that we save tons of money that way. Even during a drought, we still had unlimited you pick items. We also barter will friends. I offer to can or prepare some items for the freezer and get some free veggies for my efforts. Our HOA won’t let us garden either, so I planted my landscaping around the house with edibles. I alternated loropetalum bushes with blueberry bushes, and planted asparagus in among the flowers. It looks great, and nobody notices. Oh my! I save way more than $100! If I bought as many peppers, onions, green beans, cauliflower, broccoli, garlic, potatoes, corn, cilantro, and tomatoes as I’ve eaten in the past year either fresh , canned or frozen from the garden I can’t even imagine how much money I would have spent! I love your idea about having your kids help garden. When I was young, my parents had a vegetable farm with acres of garden, orchard, vineyard, you name it. I had to work out in the garden since I was a tiny child. I stopped gardening when I moved away, but the things I remember about growing veggies and flowers, and about agriculture in general, are really neat skills that may come in handy some day. Whenever I have kids, I definitely want my kids to know what it means to work the ground and grow something out of almost nothing. Don’t be discouraged by community gardens. The ones in our area aren’t like the way she listed above. The ones around here, you pay a fee….ours is 30 dollars a year…and you get a 10×10 plot to grow as you please. You just have to keep it weeded and disease free. Last year with our tomatoes alone (and we planted tons of different stuff) we made our money by the middle of June. Also, there are many egg co-ops where you can help with chickens and get eggs. I live in a large city and we have them here. Urban farming is big now. Speaking from the farmers point of view, I would trade fruits and veggies to someone if canned them for me. My husband and I both work in the farm. During the summer I usually sell 6 days a week. It is hard for me to preserve as much as I would like to. I would want to get to know the person pretty good before I do this though. I know not everyone is as clean as I would like. I have a friend who has an agreement like this. Her farmer gives her leftover produce that would be headed for the compost pile after the farmer’s market day. She cans what she is able, and they split the end result. A win-win situation for them. I have used small raised beds to grow veggies in for years. This year we moved, and as I was planning my garden I stumbled on the Straw Bale Gardening Method. I was raised on a farm, and had a garden in some form all my life. This method just makes sense. It is great for families in urban areas, or without a lot of space. It is also a LOT less labor intensive….no ground prep, weeding, less pests, and less water consumption. Everything is up off the ground so it is great for people with back or knee problems ( or for mamas with a baby in tow). I will update with progress throughout my gardening season and let you know how everything turns out! Happy gardening everyone!!! 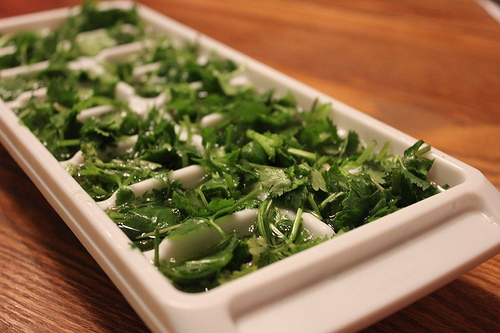 Thank you for the “how to freeze fresh herbs” idea! When I buy fresh herbs, there is always some left over and it ends up in the garbage. Even better idea to grow my own! Thank you for the inspiration – & now I have yet another project (I love projects!). Yes we plant a garden 🙂 We put our Vegetables in with our Flowers and do Companion Planting! This year is the first year in quite a while we have done this..FUN and TASTY! This is not necessarily a money saver. You need something to grow the food in (a plot or containers). You need good soil that might require amendments like peat, manure, fertilizer. You will need seed or seedlings. You’ll need to water when there’s not enough rain. You’ll need to protect the plants from animals and pests. It’s a fun project (and time consuming!) but doesn’t necessarily save money. I have a small garden plot and I spend a lot of time weeding it, even when I’ve used weed preventer fabric or newspapers. Our soil is thick clay so every year we need to add leaves or peat or the worm castings from my worm farm. If I worked on freelance writing assignments instead of spending my time fiddling with the garden, I’d earn (a lot) more than what growing a few veggies saves me. However, I do it because my kids enjoy the process. I agree with Jessica in re: to our own situation in the suburbs. Our grandchildren showed signs of wanting to grow a few things, so my husband and I foot the bill for the supplies, seedlings and seeds, as well as digging up a plot in our yard. To make a very LOOOOONg story short, the kids enjoyed the process and felt very proud of their produce. In reality we got very little yield in the 3 years we tried…..some nice lettuce and tomatoes, spindly carrots and corn, no pumpkins or watermelon, but I didn’t want to disappoint the grands and wanted them to understand where food comes from etc. We have taken it out for this season, but still have a grandson who wants to plant, so we will try a few things in pots this time around. With our short Michigan growing season, not sure what will work other than herbs which we would not use. Any suggestions? I grew up in Michigan and my parents still live there. They do manage to grow tomatoes, peppers and cucumbers in their backyard. I am in Central Ohio and have snap peas, broccoli, spinach and lettuce in my little plot. I live in Michigan too. My most cost effective container plant is loose leaf lettuce. There are lots of varieties, you could probably even get some small seed packets at the dollar store for around 20 cents. I grow them in window boxes, but any container would do. They don’t need very deep soil. I plant thickly and then eat the plants I thin to speed my harvest. Then I harvest the outer leaves until the plants bolt. I always leave at least one good sized leaf per plant when I harvest. You should be able to plant in the spring and again closer to the fall. We get almost all our vegetables from growing them ourselves. And if done right, it can be a huge money saver over time. There will almost always be upfront costs but you just have to weigh the costs and benefits. I think the best advice I can give to new gardeners is to find someone who has been gardening a while and is willing to help you out. 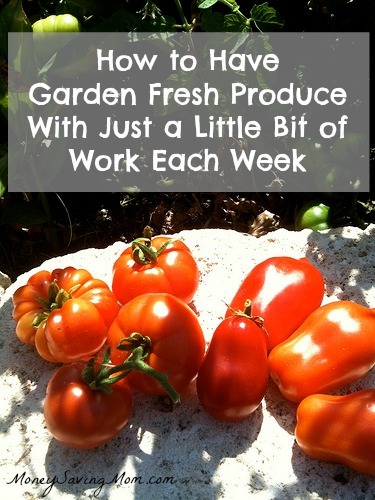 Most gardeners have lots of extra stuff laying around that they would share with you. We have some friends who moved here from Kenya and are living in an apartment. When I planted my tomatoes I potted up 2 for them. The pots were the pots that my fruit trees came in and the soil was from our garden and compost pile. Most gardeners love to share their extras. My husband and I bought a house in the fall and are planting our first garden with a bunch of veggies this year. I am excited to see it come together but it is a lot of money up front. The pots, the chicken wire, tiller, soil, etc. I know its a one time invetment but would love to hear tips on how to save money when it comes to gardening. You’re right. It can be pretty expensive to get a garden going. When we started, we just hand dug an area in the back yard, edged it with some salvaged wood, and amended the sand with some free mulch from the dump. The first year didn’t go spectacularly, but by the second season the mulch had broken down nicely. We had a great tomato harvest that year! -Compost, both kitchen scraps and paper scraps. Squash and melons love to grow near compost areas. Just dig a hole in your garden, fill with scraps and cover with dirt as necessary. No need for a fancy composter, though those are great I’m sure. – Utilize free mulch. We called some tree-trimming companies and let them know they could dump chippings in our yard. When they’re trimming in the area they’ll empty the truck in our yard, and we have enough mulch to do all our flower beds, trees, etc. (They call ahead to make sure we still want the mulch, so it’s not like our whole yard is in danger of being one big mulch pile.) The dump here also mulches yard clippings and gives it away. – Free manure: We live in an area with lots of horse farms, and many of them will let us come collect as much manure as we want. I haven’t done this much, but it is a way to save money. Cow, chicken, turkey, and rabbit manure are also great, though some manures need to be composted before adding them around plants. I love growing fresh herbs. To me they are the biggest money saver. Fresh herbs are so expensive in the grocery store, so growing my own basil actually saves me more money that growing my own squash (although I usually grow squash too because it’s so easy). I like to think about what the most expensive produce is, and if I can grow it. I don’t grow potatoes, for example. They are cheap to buy, and more work than they’re worth to me. But I grow heirloom tomatoes because those bad boys are expensive! I’ve tried repeatedly to have a garden, but the results are pretty predictable. If I plant the garden in the yard, the deer, raccoons, armadillos, rabbits, squirrels, and every other critters you can imagine feast on the fruits/vegetables of my labor long before I get a chance to. If I use containers, the plants die a painful, dry death long before they have time to produce anything. I can water all day long, but it doesn’t make a difference because my summer days top 100 degrees. And while I love the taste of home-grown tomatoes, strawberries, and watermelons, it’s expensive to buy plants, good soil, etc. only to have everything fizzle.